Designs by Lisa Somerville: Our Daily Bread Designs December Release Blog Hop! Our Daily Bread Designs December Release Blog Hop! Welcome to the New Release post showcasing projects from Our Daily Bread Designs December Release! You can see all of the December Releases here. Continue reading below to find out how you can win one of three $25 Gift Certificates to the ODBD Store good towards the purchase of ODBD stamps. 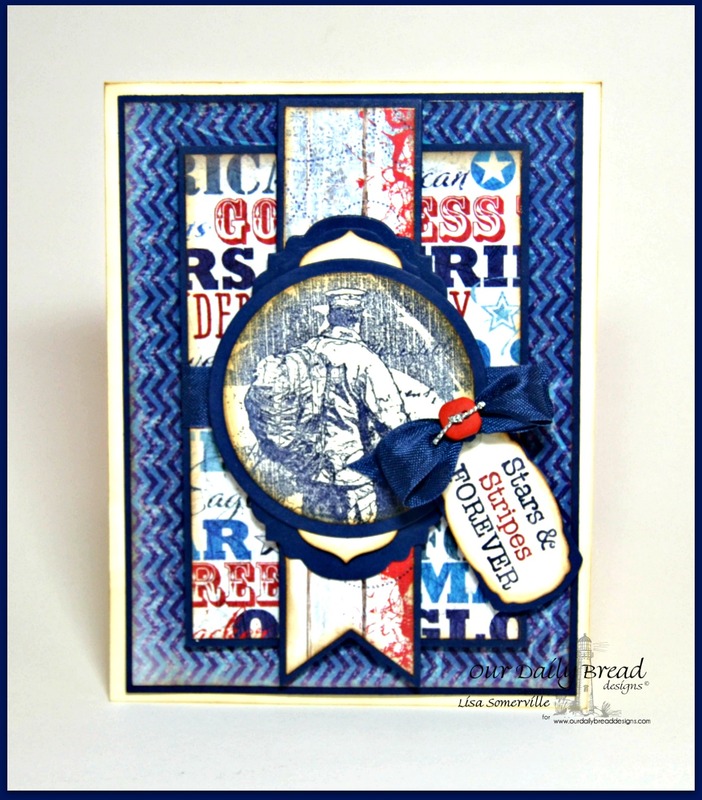 I created two cards using the new ODBD Patriotic Paper Collection, Mini Tags Dies and American Hero stamp set from the December Release along with additional ODBD stamp and Custom Dies. This card also uses the Pennants Die, Circle Ornaments Die, Matting Circles Die, Beautiful Borders Dies and Sparkling Stars Dies along with the Some Gave All stamp set. To embellish, I added Silver Gems, Cording, a Button and Seam Binding. This card also uses the Pennants Die, Circle Ornaments Die, Matting Circles Die and Antique Labels and Border Die along with the Not Forgotten stamp set. To embellish, I added Silver Cording, a Button and Seam Binding. Click here to shop Our Daily Bread Designs Cyber Monday Sale! Three randomly selected winners will each receive a $25 gift certificate to Our Daily Bread Designs, good towards the purchase of ODBD stamps found in the "stamps column" of the ODBD Website, just for commenting on the Design Team cards! You have until Tuesday, December 2, 2014 at 9:00 p.m. EST to leave your comments. The Winners will be posted December 3rd, on Our Daily Bread Designs Blog, so be sure to check back there to see if you won! Love them both, Lisa!!! You are such a natural when it comes to patriotic cards....I sure could use some lessons!! Fabulous designs...no shock there!! HUGS!! Lisa, I love your use of these Patriotic papers!!! Kudos to you and your creativity!!!! Great patriotic cards. I'm sure any soldier, active or retired would love to get one. Wonderful new releases this month. AMAZING cards, love the layouts. How you can use all those supplies in one card is a w wow factor. Love that paper. Lisa, your cards are great! I'm especially liking the new red, white and blue, papers. You showcased them very well. Love these cards! I love making cards for veterans, yours are fabulous and a great inspiration! Such a beautiful pair of cards! You truly have an eye for the patriotic! Thank you for sharing today! Lisa, this is a great pair of cards. Love the little tags and button detail on each especially. Tfs! What beautiful display of the dies and papers Lisa!! Such vibrant and bold patriotic cards with such unique layouts!! Both patriotic cards are beautiful and inspirational, Lisa! Love the papers and the fabulous designs on each. Wonderful use of the tags and the banners! Hugs! Love both cards Lisa! Beautiful use of the new papers and I love the mini tags and stars on the first one! Great inspiration for patriotic cards. I like how the stamped image stands out without being colored. Two great cards! The mini tags sentiments and dies will be quite useful. Lisa, your patriotic cards are beautiful! I really like the sentiment on the first card...so true! God bless our soldiers :) !!! Fantastic cards, Lisa. Thanks for sharing! Totally agree! You are certainly a natural Lisa. These cards are so well done. I've always liked how you combine different designer papers. Just perfect! 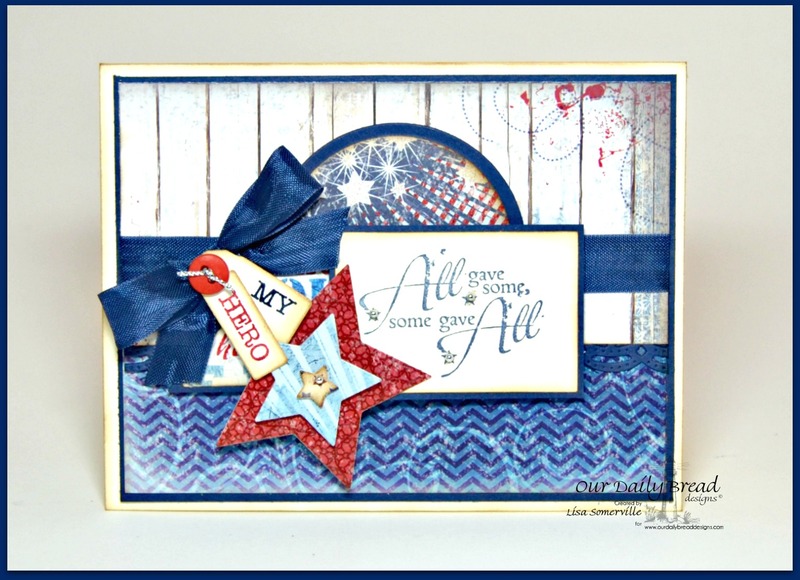 Lisa...beautiful patriotic samples! Love the designs on both! Well done, my friend! Lisa, you always create the most wonderful patriotic cards! Love how you combined all the papers and dies with the images! Two great cards! Both cards are wonderful! Great job on them! Both are so beautiful!! I love the layout on that first card and all the beautiful papers and those cute little bitty tags. Both patriotic cards are absolutely stunning! Love the layering of the mini tags and the soldier images is so perfect with these new papers! Love the patriotic feel to both projects! The colors are vibrant and your choice of images... perfect! LOVE these RWB cards!! Really cool how you mixed and matched the papers. Love the 2 colors of ink on the tag!